Although they handle most tasks associated with building a new home or remodeling an old one, their most commonly requested services include: new residential home construction, design services, general home improvements, room additions, kitchens, and bathroom remodeling. 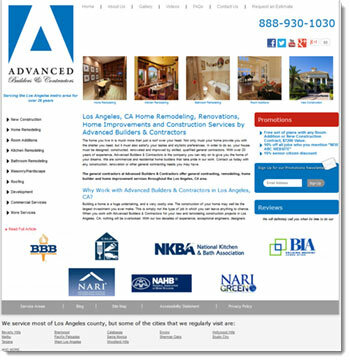 Whether you want to build a new commercial building or residence from the ground up, or you want to add an addition to your home, you can always rely on Advanced Builders and Contractors for truly exceptional service. A construction project on any scale is not something that you can afford to gamble with. You must be certain that your residential or commercial construction company has the skill, training and experience necessary to complete your project properly. Call them any time at 888-930-1030 to discuss the many different services they have to offer you. Whatever construction needs you may have, they can ensure that the job is done right.